Vision Exchange is a commercial building situated at 2 Venture Drive Singapore 608526 in District 22. 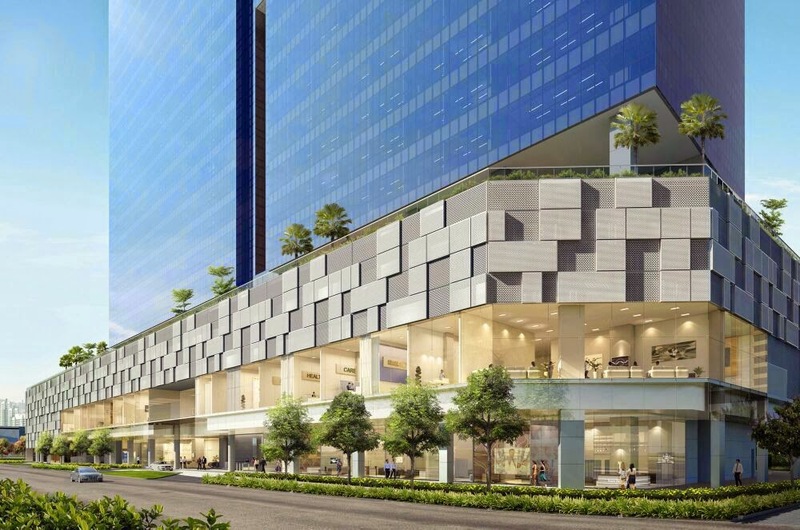 It is a 25-storey commercial building filled with office units, medical suites and a retail podium. 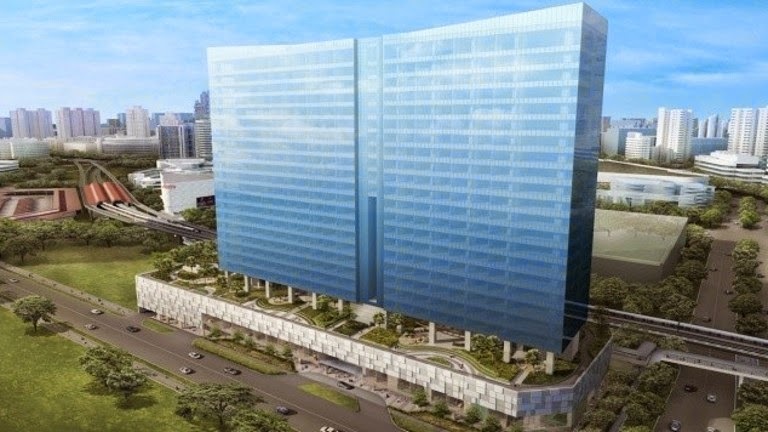 The developer is Sim Lian JV (Vision) Pte Ltd, Sim Lian Group. This 99 years leasehold commercial building is expected to T.O.P in 2018. The total site area is about 124,096 sqft. There are a total of 304 car park lots + 3 handicapped lots here. It has 6 loading/unloading lots. Also there will be 12 passenger lifts and 2 service lifts. The office units size is about 41-158 sqm, medical suites size is about 17-109 sqm and F&B/restaurant unit size is about 29-96 sqm. In total there are 47 F&B units, 53 Medical Suites and 640 office units. On Level 1, there will be 49 Medical Suites and 25 F&B units. On Level 2, there are 29 Medical Suites and 22 F&B units. On Level 3 & 4 is the car park. On Level 5 lies the facilities deck. From level 6 to 25, there are a total of 640 office units with 32 units per level. Vision Exchange is envisioned to be commercial hub in Jurong outside central business district area. It is located strategically within Jurong Gateway, next to shopping malls like Westgate, JEM and Big Box. Vision Exchange is located at 2 Venture Drive Singapore 608526 in District 22. 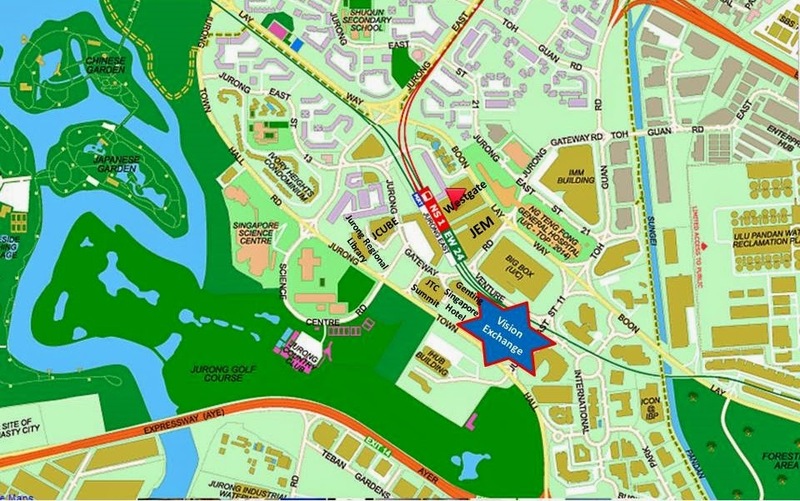 The nearest Mrt station is Jurong East MRT Station which is approximately 0.41 KM away. Other nearby Mrt stations includes Chinese Garden and Clementi Mrt stations. There are also several bus services available around here and at Jurong East bus interchange. Major expressways like AYE and PIE allows you to get to many places conveniently. Driving to Singapore’s Central Business District/ Marina Bay district will take you under 20-25 minutes. It is located in the western part of Singapore and is seamlessly connected to the rest of the country. Malls: Nearby mega malls like JEM, J Cube, IMM, Westgate, Taman Jurong Shopping centre, Clementi Mall and Jurong Point and many more others which have a myriad of amenities like eateries, retail shops, supermarkets and banks. For more shopping, dining and entertainment purposes you can head down to the Orchard shopping district and Marina Bay District which is about less than 25 minutes’ drive away. Restaurants: For more dining options to satisfy your taste buds, head down to the restaurants along Jurong East Central, Bukit Batok Central and Clementi Central. For hawker food lovers, you can head down to Taman Jurong Market and Food Center, Yuhua Market & Hawker Centre, Jurong East Delights, Teban Gardens Food Centre and Ayer Rajah Food Centre & Market. Condominiums: There are also several prestigious residential buildings like Jurong Westgate, Hundred Trees, Ivory Heights, Caspian, Parc Oasis, Lakeside Grove, The Centris, The Lakefront Residences and The Mayfair which are highly sought after by locals and expats. Supermarkets: The nearest supermarkets is Giant Hypermarket at IMM, Sheng Siong supermarket at 61 Teban Gardens Road, Prime supermarket at Blk 159 Bukit Batok Street 11 and NTUC Fairprice at Blk 135 Jurong East street 13. Healthcare: The nearby healthcare facilities are Jurong Polyclinic, Westpoint Family Hospital, Jurong Medical Centre, National University Hospital and the upcoming Jurong General Hospital in the area to provide specialist healthcare services for the residents. Education: The primary educational institutions around include Fuhua Primary School, Yuhua Primary School, Bukit View Primary School and Princess Elizabeth Primary School. The Secondary Schools in the neighborhood include Shuqun Secondary School, Commonwealth Secondary School, Bukit View Secondary School, Fuhua Secondary School and Bukit Batok Secondary School. Tertiary institutions include NTU and Jurong Junior College. Recreational facilities: There are many recreational facilities around here include Chinese Garden, Japanese Garden, Jurong Golf Course, Jurong Country Club, Ayer Rajah Community Centre, Hong Kah North Community Club, Yu Hua Community Centre and Lakeview promenade. Places of worship: For places of worship in this multi-racial and religion society, one can head to Masjid Almukminin Mosque at 271 Jurong East Street 21, Sri Arulmigu Murugan Temple at 281 Jurong East Street 21, Ling Hong Tong & Tua Peh Kong Temple at 10 Bukit Batok Street 21, Tong Tien Kung Temple at 8 Bukit Batok Street 21 and Seventh Day Adventist Church - Jurong East at 90 Jurong East Street 13. Vision Exchange is definitely a highly sought after commercial building as it is located near to Jurong Hub. There are a myriad of facilities in-house and nearby to cater for all your needs. For more details, please contact the relevant personnel.